Alexandra Blouin and Jessica Kaufman take center stage as bad girls in Chicago. Taiquira Williams as the aptly named Maude Lynn in The House That Will Not Stand. The 2014 play The House that Will Not Stand, written by poet/playwright and Oakland native Marcus Gardley and now playing at Redwood Curtain Theatre under the direction of Michelle "Chelly" Purnell and Clint Rebik, is a spirited historical comedy with music and a voodoo spell, set in antebellum New Orleans. The year is 1836 and in the Faubourg Tremé, the wealthy Lazare Albans has just died; that's his corpse we see when the curtain rises, laid out beneath a sheet in the parlor of his tasteful home. Since Albans had two families, an official white one and an unofficial one of color, his sudden death makes trouble. Albans' widow Beartrice (Ramona j.j. Bell) is a freewoman of color who wants to take advantage of her now doubly emancipated state and return to Paris, but recent laws mean the proceeds from her estate may go to Albans' official widow (Raechel Robinson) instead. Makeda (Chryste L. Johnson), the trusted house slave/confidante grown old in the service of the Albans, now wants to buy her freedom — a request Beartrice repeatedly declines. Crazy aunt Marie Josephine (Tina Okoye) is confined to the house and sees ghosts. The family's three daughters are Odette (Michelle "Chelly" Purnell), Agnès (Ayanna Elon Wilson) and Maude Lynn (Taiquira Williams). (I'll let you guess which sis gets in touch with the paranormal.) The eldest, Agnès, wants to go to the quadroon ball, where well-to-do young women of mixed race make their debuts — she hopes to contract a relationship through the Creole custom of plaçage, in which young black, Native American and Creole women are "placed" into common-law marriages with the white men who purchase them. Her mother wants her to stay home and her sisters must decide whether to help or hinder Agnes' plan. Lazare Albans (Brad Harrington) makes a surprise reappearance at one point in the chaos that ensues, conjured by Makeda's voodoo spell. Robert Pickering's set design breathes a suggestion of wrought-iron balconies, brocaded wallpapers and ancestral portraits into the Albanses' parlor; Cory Stewart's sound design conjures heat, night-flying insects and the thrum of palmetto fans through humid air. Catherine L. Brown's costumes deploy a pastiche of fripperies for a sense of bygone times. 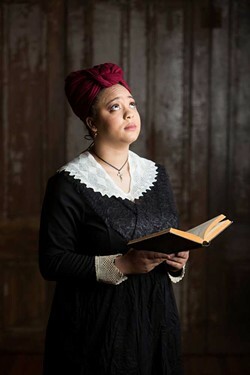 Bell commands the stage with formidable grace as Beartrice; Okoye is luminous in song in the role of the otherworldly Marie Josephine, a truth-telling, housebound nymph savant. Harrington plays Lazare as a mellow patriarch who, even after death goes with the flow, exuding a passive-aggressive befuddlement at the swirling intrigues. Johnson, playing Makeda, leaves a powerful impression when she breaks into song during her voodoo spell, calling out the names of spirits. Unfortunately, absorbing moments can be undercut by the writing, which at times positions Makeda too close to a stock Mammy character for my liking. Bursting into song about making gumbo for other characters, for instance, seems labored. 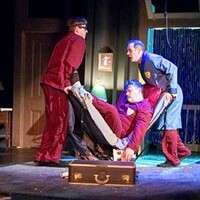 The House that Will Not Stand plays at Redwood Curtain Theatre on Thursday, Friday and Saturday nights at 8 p.m. through May 26, with Sunday matinees at 2 p.m. on May 13 and 20. Call 443-7688 or visit www.redwoodcurtain.org. Bob Fosse was a legend on Broadway through the 1960s and 1970s, first as a choreographer, then doubling up as a director, blazing a trail from Damn Yankees to Sweet Charity and onward. He morphed with the fast-changing times onstage and in the world at large, and in 1975 he had a hit on the Great White Way with Chicago. That production has proved an enduring work, with its choreography and Jazz Age detail. Now onstage at the Ferndale Repertory Theatre, directed by Patrick Spike, it's a lively work worthy of the saucy era in which it's set, the mid-1920s in the Windy City. With touches of salaciousness, celebrity and tabloid treachery, it's easy to see why it's been restaged through the ensuing decades. Young Roxie Hart (Jessica Kaufman), a chorus girl with designs on bigger things, shoots dead a lover who's done her wrong — no better action to start a story such as this — and then fails in getting her husband Amos (Dillon Savage) to take the fall for her. Off she goes to the Cook County pen, where things kick into high gear. Through a series of great musical numbers, we meet a chorus of women accused of murdering their two-timing lovers, including the darkly marvelous Velma (Alexandra Blouin). It's here the well-played comic parts and those satirizing the tabloid culture of the era click well, especially when scheming attorney Billy Flynn (most snazzily played by Gary Bowman) appears — his job is to sway juries as well as the court of rubes, er, public opinion. One great thing about Chicago is that no one ever is revealed to have a heart of gold, which fits the mood of the proceedings. 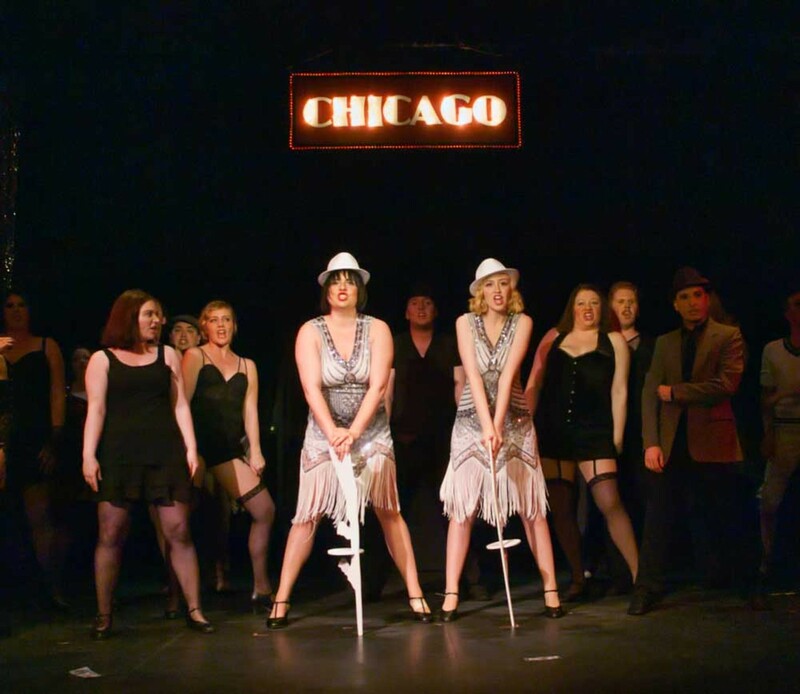 In some ways, Chicago might seem like more of a revue but there's method here: It's a narrative story unfolding through musical numbers stylistically in step with hyperkinetic Vaudeville, that genre to which so many in the story aspire. Not everything hits its marks in this Chicago, which is an ambitious show to stage and not all the material ages well. But above all, Blouin is a standout, building on a great resume as an actor/choreographer (Bat Boy, The Rocky Horror Show, Boeing Boeing) and capping it off perfectly as Velma. Song-and-dance-and-all-wise, she's the straw the stirs the drink in an iconic tale of tawdriness with a soundtrack that just keeps on roaring around us all. 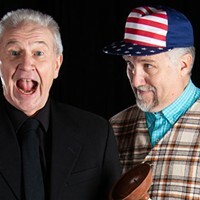 Chicago plays at the Ferndale Repertory Theatre in Ferndale on Fridays and Saturdays at 8 p.m. through June 2, with Sunday matinees at 2 p.m. through June 3. For more information, call 786-5483 or visit www.ferndalerep.com. North Coast Repertory Theatre kicks off its production of the glam-rock, genderqueer rock musical Hedwig and the Angry Inch on Thursday, May 10 at 8 p.m. and rocks through June 9. Call 442-6278 or visit www.ncrt.net.